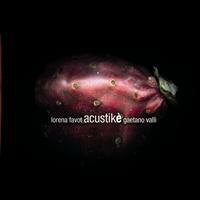 Lorena Favot and Gaetano Valli through their artistic connection and musical understanding bring to life the new CD "acustikè". A Liberal "Mix" of traditional jazz tracks such as "My heart belongs to daddy" (Cole Porter) and "Speak Low" (Ogden Nash - Kurt Weill). A project of acoustic dimensions, motivated by an interest in natural sound, spontaneous and direct!